There’s this dish at a place that I just learned is within delivery distance of mine. It’s really delicious, and just when you thought it was enough to cross “osso buco risotto” or “veal rice dish” off your list – you are pleasantly surprised by another push, a kick of flavor at the end. A spice. Sweet green peas…relief. Throughout, you are delivered that creamy, slow-simmered richness. It’s more of a flavor than texture study, but it’s such a good one thatÂ you want to keep on reading. 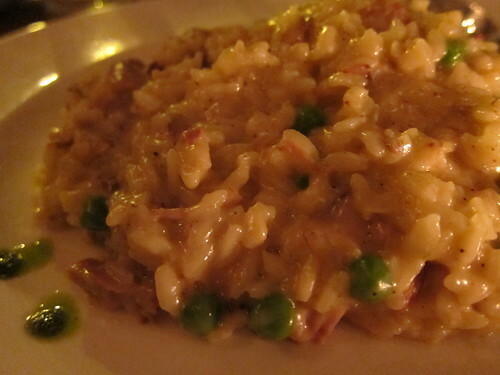 All the reasons you wouldn’t have ordered the risotto entree in fear of the one-note go out the window with Osteria La Buca’s Osso Buco Risotto. Say that ten times fast. Or, just order it – it’s off-menu. You can also try a reliable plate of burrata, prosciutto and tomatoes to start. What also was a big hitÂ was another off-menu pizza with figs, kale andÂ tomatoesÂ – but it would be unfair to go further into that. Just consider this a vouch for their other itemsÂ on the menu. The best thing is that the prices are reasonable – perfect for that quick dinner delivered straight to my place withÂ zero emissions andÂ zero guilt. And if you feel like dining there, the atmosphere is pleasant – and is even about to get upgraded at the end of the month.Â Until then,Â it’s painted pink in solidarity in the fight against breast cancer and proceeds go straight to the Susan G. Komen Foundation. What a great cause and reason to dine at Osteria La Buca – all the while enjoying some great rustic. Delivery on a Zero electric motorcycle within 1.5 mile radius. This entry was posted in Food, Hollywood, Melrose and tagged Breast cancer, cancer, Italian, October, off-menu, Osso Buco, ossobuco, Osteria La Buca, pink, Pink for October, rice, risotto, Susan G Komen, veal. Bookmark the permalink.